In the spring of 1989, TWO big 4-8-4's traveled west to star in the 50th anniversary celebration of Los Angeles Union Passenger Terminal. We covered Union Pacific 8444 all the way from her home in Cheyenne, Wyoming, to Los Angeles, including a brief encounter with a snowstorm! 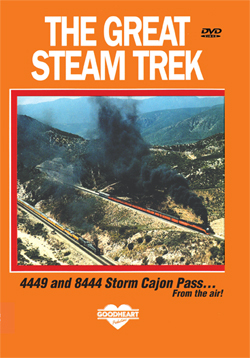 You'll also see unbelievable helicopter scenes of 8444 pacing Southern Pacific "Daylight" steam locomotive No. 4449 up through Cajon Pass on parallel tracks. In fact, although the gray and black 8444 is the star of this video, there's almost as much coverage of the gorgeous orange and red "Daylight" 4449! We covered her move to LA all the way from her home in Portland, Oregon. Wait until you see our aerial views of the 4449 rolling off the miles on the "Coast Route!" Absolutely beautiful! There is also coverage of the steam and diesel exhibits at the LA Union Terminal Celebration just before the dramatic conclusion when both locomotives storm up Cajon Pass!